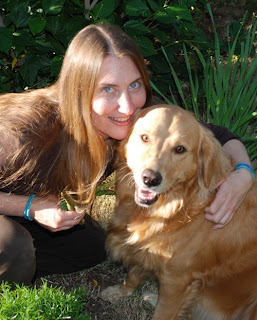 Sindi Somers Loves Writing, Animals, Comedy, the Arts and more! : Another article by Sindi Somers featured in San Diego Pets magazine along with a photo with Ms. Ginger in the December 2008 issue! Another article by Sindi Somers featured in San Diego Pets magazine along with a photo with Ms. Ginger in the December 2008 issue! San Diego girls and Seattle transplants, Sindi and Ginger Somers help each other stay healthy with daily walks, playtime, hugs and fresh food including veggies like the asparagus in hand. *Cat parents please make note of one additional reminder not mentioned in my article. Certain house plants, including the holiday favorite poinsettas are poisonous to cats and can be fatal if ingested. As published in the December 2008 issue of San Diego Pets magazine. View and download the issue in its entirety at http://www.sandiegopetsmagzine.com/. It is often implied and almost universally permissible for us humans to eat extra helpings and goodies during the holidays. During these times of celebration, it can be equally tempting to extend this over indulgent tendency to our beloved pets. Although it can be fun and an expression of our affection to lavish our pets with additional snacks, it is important to remember that just like us, nutrition is an important consideration year round. I am not suggesting eliminating treating, but inside being aware of feeding in moderation, meal portion sizes based on your pet’s activity levels and making overall healthy food choices. More and more of us are including our pets as valuable members of the family. Our challenge is to satisfy our desire to include our pets without getting them too far off their regular diet and nutritional path. One idea is to feed your pet their meal at the same time you eat so they will be busy with their food for at least part of the time that you are enjoying yours. Giving your pet a new or favorite toy or something healthy to chew on is another option to help deter tableside begging that might be hard to ignore. I find that giving my dog a tendon chew, bully stick or uncooked, raw beef marrow bone helps keep her occupied while I eat my dinner. This helps her to feel included in my mealtime activity instead of being left out. If your pet is highly food obsessed like my dog, you may need to come up with some additional plans of action when snacking. If I am snacking between meals or I don’t have a chew or bone for my dog, even a small taste or treat can help her know that she is not being punished or deprived. It can be helpful to wait until you are done eating so you don’t feel the need to give multiple tastings. I am lucky that my dog likes vegetables and some fruit. While I might be eating something with a high caloric intake, I can be giving her cauliflower, green beans. asparagus or other non-starchy vegetables. This adds to the fiber and nutrition of her diet while adding minimal calories. Bonnie Barton, Nutritional Consultant and Manager of Paw Country holistic pet store in La Mesa (http://www.welcometopawcountry.com/) suggests “making feeding time more interesting” and thus more fulfilling for pets. Using toys designed to slowly administer food as they are played with will take more time and energy than simply placing your pet’s meal in a bowl. Having to think and manipulate the toy to find a way to get the food out of these clever devices will challenge your pet’s brain and can help take its attention off other household activities, such as family mealtime and snacking. This alternative feeding process not only exercises your pet’s mind, but it can satisfy dogs’ and other animals’ natural scavenger and food finding instincts. It can also be quite entertaining for us pet parents and our holiday guests to watch! “Treat toys” do not have to be limited to holiday use or special occasions. They can actually be implemented frequently, even daily to add excitement and mental stimulation to your pet's feeding routine. Another option I have seen work beneficially is using a treat toy, such as a “Kong” or similar brand with a large opening and filling it with wet canned, moistened dehydrated or freeze dried or fresh raw or cooked food and then putting it in the freezer. Feeding the food in this frozen state will add even more time to the food consumption activity. This is because manufactured pet food is highly processed, which diminishes vitamins, minerals, digestive enzymes and its overall nutritional value. Giving unseasoned, freshly cooked or raw meats and vegetables, as well as some fruit will help your pets receive more of the actual nutrition that is eliminated during factory processing. I use the analogy of how I may choose to have a fresh raw salad, versus a processed can of green beans with a long shelf life in order to obtain more nutrients in my diet. Although it can be fun and a healthy addition to your pet’s diet to feed them what you are eating, there are certain items that should be completely avoided to preserve your pet’s health. Chocolate is probably the most well known no-no for pets. However, there are many others that can cause severe illness and even death. Depending on the type of pet you have, it is best to avoid onions, including chives, grapes, raisins, salt, caffeine, certain species of mushrooms, diet products containing the sweetener Xylitol and other artificial sweeteners, macadamia nuts, fat, fried and processed foods including ham and bacon, cooked bones and alcoholic beverages of any kind. Spoiled and moldy foods should never be fed and dairy foods should be given with caution. Although dairy products are not necessarily considered poisonous, they can lead to digestive issues in some pets, especially when fed in large amounts. I have personally heard both sides of the argument in whether to allow dogs to consume the vitamin rich avocado. Although there is documented evidence that dogs, as well as cats, birds, cattle, goats, horses and even fish have been harmed and even killed from ingesting some part of the avocado plant, the controversy remains. The avocado holds many beneficial health properties that when given in small amounts may, for some outweigh the risk of illness. With its proven toxicity that has led to gastrointestinal distress and more serious complications in some pets, it is important to know that not just the meaty fruit, but all parts of the avocado plant are toxic. In addition to the avocado, the pit, leaves and bark of its tree contain a toxin called persin that is harmful to animals, especially when ingested in large quantities. Birds seem to be especially sensitive to the avocado’s toxic element. Some of the most detrimental effects, including fatalities have been seen in birds, as well as rabbits, horses and cattle. There is enough evidence of its toxicity in its raw form that has kept me from personally feeding it to my own dog and cat, but I have heard multiple reports that some dogs tolerate it without any visible issues when consumed in small amounts. Consumers may even notice avocado as an ingredient in some FDA approved pet foods. According to information on the ASPCA website, there is not enough data about the avocados used to discourage pet parents from feeding processed pet food that contains avocado. For the most current information on safe foods and those to avoid, you may wish to visit the ASPCA’s Animal Poison Control Center on their website at http://www.aspca.org/. One last reminder is to not overlook the importance of continuing your pet’s exercise regime during the holidays. A long walk or play session can help diminish your dog’s energy level and inspire calmness and naptimes. Cats, birds and other pets need attention and play time too, so be sure not to forget them! A half hour to an hour of physical activity before mealtime or prior to guests arriving can help your pets release stress, anxiety and excess energy once again increasing the chances of having calmer animals requiring less attention and treats during meal and snack times. The holidays are meant to be enjoyed! You don’t need to completely deprive your pets to keep them healthy when including them in the festivities, but you don’t need to overindulge them to show you love them either. By knowing your pet you can devise a plan to help give them the mental stimulation, nutrition, physical activity and TLC, they need so you and they are satisfied and happy this holiday season.